Complementary presentations identify and demonstrate how water is an emerging challenge in the environment and how common sense solutions can provide immediate results. 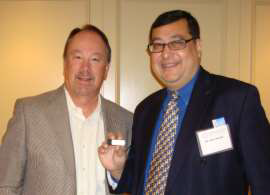 Dr. Adil Najam (holding the Presenter USB), Dean of the Frederick S. Pardee School of Global Studies at Boston University and Terry Mullin, CEO of ViridiSTOR LLC (left to right). Dr. Najam spoke about water as an emerging challenge in what he called the ‘age of climate adaptation.’ His presentation pointed out the connections between climate change, development and human security and he suggested that the response to these crises lies in adopting a human development framework. He argued that the nature of these challenges required concerted international action but also needed individual action. It is in the later that the role of voluntary service organizations is key. “The ViridiSTOR solution creates paperless events while addressing one of the key components of the water crisis – reducing the amount of water consumed in paper production,” stated Dr. Adil Najam, Dean of the Frederick S. Pardee School of Global Studies at Boston University and 2007 Nobel Prize recipient. “Paper production is one of the most intensive users of water in its production and their solution makes an immediate and quantifiable positive difference,” stated Najam. Mullin presented on common sense sustainable events strategies and solutions that make a definitive positive impact. “The event industry is one of the most polluting industries in the United States,” stated Mullin. “And in addressing sustainability, you must find solutions that don’t increase costs. The ViridiSTOR solution reduces costs and creates new profit streams for events while providing sustainable savings that can be measured,” Mullin added. “Their common sense approach to deliver information digitally in the full context of the event allows vast amounts of information to be delivered, including video,” added Najam. “To quite literally have everything about a conference or meeting on the Presenter USB is very powerful. And by going paperless at the nearly 2 million events held annually in the United States alone can make a tremendous positive difference by not polluting water that could otherwise be used to sustain life,” added Najam. “We address a balance of the economy and the environment with our solution,” Mullin said. “Many are amazed that it takes over 10 liters of water to produce a single piece of paper, yet 80% or more of handouts at conferences and trade shows are thrown out before even returning home. Information is key in today’s digital post-paper world, but we don’t really want it delivered on paper,” Mullin stated. The Service Club Leaders Conference (SCLC) is comprised of national or international organizations or federations of local community-serving clubs in which service-minded individuals have voluntarily banded together to create and strengthen cultural, spiritual, moral, business and ethical standards and, through fellowship and altruism, to serve the citizens of their communities and nations. This year’s conference was hosted and organized by the Lions Club International and included participation from organizational leaders of 21 service organizations including American MENSA, Kiwanis, Lions Clubs International, Optimist International, Pilot International, Rotary International, Sertoma, Toastmasters International, and Jaycees, amongst others. Based in Tustin, CA, ViridiSTOR LLC was established with the goal of providing the world’s first environmentally and fiscally sound business solution for the information technology market. The Presenter USB and Green Box™ solution replaces paper-based materials at trade shows and conferences, greatly reducing the environmental impact of the event while increasing the usability of information for attendees. For additional information, please visit the company’s web site at http://www.viridistor.com.